Thomas K. Goldstick, emeritus professor of biomedical engineering and chemical and biological engineering, passed away on January 13, 2017 at age 82. He will be remembered as a dedicated teacher, noted scholar, and pioneer in his fields. 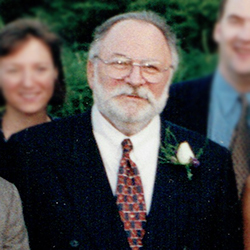 A member of Northwestern’s faculty for 32 years, Goldstick studied physiological oxygen transport in blood and tissue, specifically focusing on the arterial wall and the eye. He often collaborated with fellow Northwestern professor and former student Robert A. Linsenmeier. Together, they tested a promising, emulsified blood substitute that increased oxygen delivery to the eye — research that made national headlines in the 1990s. Goldstick’s pioneering work led to his induction into the American Institute of Medical and Biological Engineering and membership in several professional societies, including the American Institute of Chemical Engineers, Biomedical Engineering Society, where he served as director from 1983 to 1986 and publications chair from 1985 to 1987, and the International Society for Oxygen Transport to Tissue, where he was the proceedings editor. Born in Toronto, Canada, Goldstick showed an initial interest in metallurgical engineering. After earning his bachelor’s and master’s degrees in the subject from the Massachusetts Institute of Technology, he worked as a research engineer for Jones & Laughlin Steel Corporation in Pittsburgh, Pennsylvania. He left the steel industry in 1961 to pursue a PhD in biomedical engineering from the University of California at Berkeley, where he was advised by Professor Irving Fatt. When Goldstick became a Northwestern assistant professor in 1967, he was appointed to the Departments of Chemical Engineering and Biology. The biology department split in the 1980s, and Goldstick’s appointments eventually spanned three departments: the Departments of Chemical and Biological Engineering and Biomedical Engineering in the McCormick School of Engineering and the Department of Neurobiology and Physiology in the Weinberg College of Arts and Sciences. At Northwestern, Goldstick was more than a researcher and teacher. His contributions to student learning and Northwestern’s curriculum were invaluable. He advised many undergraduate, graduate, and doctoral students even well after his retirement. He also designed core biomedical engineering courses, including Transport in Living Systems and Systems Physiology, as well as biomedical engineering’s senior design capstone. Goldstick developed the capstone course in the early 1980s to challenge students to use engineering skills to develop useful devices in collaboration with clients. A lifelong learner, Goldstick did not end his education after he settled into his career as a professor. From 1971 to 1973, he served as a National Institutes of Health special postdoctoral fellow and a medical student at the University of California at San Diego, where he continued studying biology at a deeper level. Not only did his medical studies inform his engineering research, Goldstick also served as an associate research staff member at Evanston Hospital in Illinois from 1974 until his retirement in 1999. He was also a long-time consultant for the Edward Hines, Jr. Veterans Affairs Hospital in Hines, Illinois. Goldstick is survived by Marcia Goldstick, his beloved wife of 34 years; step children Alisa (David) Stanfield and Neil (Eliza) Stern; and grandchildren Matthew, Gavin, Jake, Rachel, and Lucy. Chapel service was held Tuesday, January 17 at Shalom Memorial Funeral Home in Arlington Heights. Outside of work, Goldstick was a fierce advocate for social justice and generously contributed to many organizations. Donations in his memory may be made to Southern Poverty Law Center, www.splcenter.org.